Besides getting a refund check from the IRS, there are few mailbox moments as exciting as receiving a hand addressed letter or note. There's something about seeing your name in an actual peron's handwriting that let's you know that this piece of mail is uniquely meant for you. Direct mail companies know this -- some computer fonts are made to look like handwriting in an effort to trick the recipient into thinking they are receiving personal mail. It doesn't take an expert to figure out a machine spat out your name and address along with tens of thousands of others. Some companies even employ actual humans to physically write out names and addresses in an effort to increase their "open rate." They know that anything that doesn't look like a bill, check or letter hits the trash before it is ever opened. Calligraphy can get pretty expensive. It's extremely time-consuming to do. And there aren't a lot of people who can sit down for hours on end copying addresses onto envelopes without losing their minds. Think Bartleby the Scrivener without the psychological disorder. 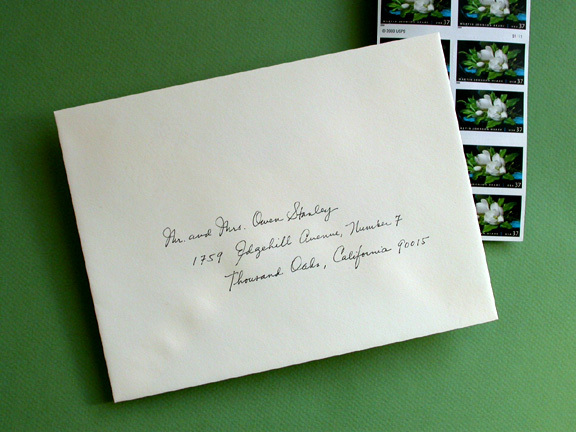 But if you have a special occasion that requires multiple mailings like a wedding or anniversary party, you should really consider hand-addressing your envelopes. If you're watching your expenses, consider writing the addresses yourself. Is you handwriting really that bad? Could it be improved with a little concentration and effort? If your handwriting is truly hopeless, say, if you're a doctor, you might consider plan B which is to get somebody else to do it. I've suggested hiring a high school student with decent penmanship but I'm rethinking that advice. High school is the time people are trying on their adult personalities and consequently high school age penmanship has a somewhat affected, juvenile quality to it. Maybe you can talk an older relative into helping you out. A lot of older men and women (over 60) have beautiful penmanship as a result of years practicing the Palmer Method. If their handwriting is a little unsteady, think of it as adding a little personality to the writing. 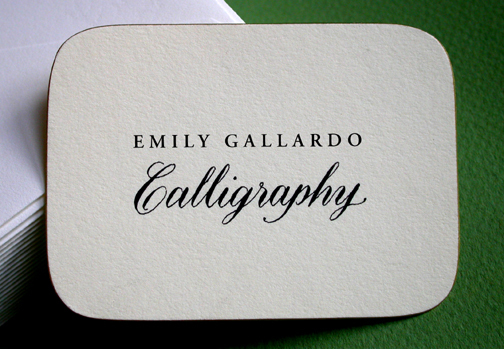 A professional calligrapher is a great choice for most people. A lot of calligraphers will have a variety of styles to fit the occasions, styles, and budgets of their prospective clients. Celebrating the special occasions in your life deserve extra attention. Hand-addressing envelopes is only partially about making an aesthetic statement. It is really about the personal touch. It says to the recipient, "You are special to me and I want you to share in my happiness." What could make a better impression? It's so rare to see hand-lettered signs these days. Getting professionally designed and manufactured letters might give most businesses and residences a more finished look but the price of that polish is a certain dull uniformity and lack of spontaneity. I'm all for uniformity in highway signs and street signs. I'll even concede that zoning codes have their place. But for me, finding a beautifully hand-lettered business sign or street number is like finding a fifty dollar bill on the ground. It's so unexpected, so delightful. When I pass this street number, I try to stop and admire it. I wonder about the person who drew it. 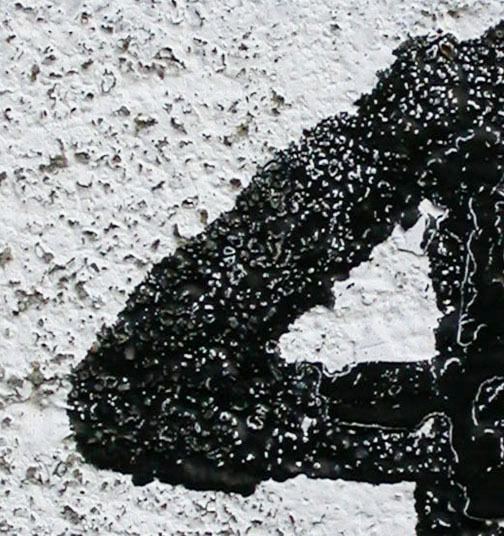 That person had the presence of mind to paint a layer of white on the concrete substrate before drawing the black numerals so there would be more contrast between the numerals and the background. Genius! Upon closer inspection, you can see the texture of the concrete breaking through the paint -- who would have thought the ravages of time and weather could look so beautiful? The vigor of the strokes says the writer has some training in lettering or is just extremely confident; quite possibly both. There is no house or brownstone at 49 Clarendon Street right now. It's just a vacant lot that some folks use for parking. 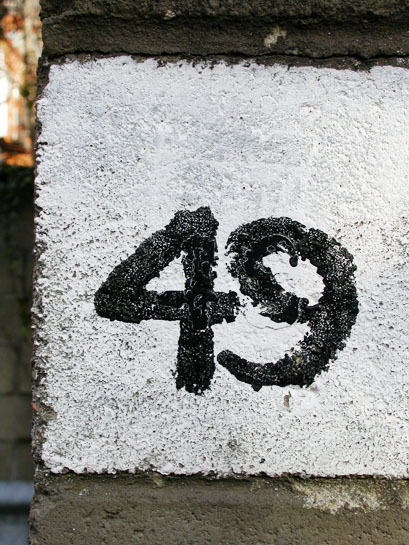 It's just a matter of time before it gets developed and it's goodbye hand-lettered 49 and hello spiffy, store-bought, brass numbers (visibly affixed with screws, no less). While it's here, I'll visit it. I'll take pictures of it. I'll build a little home for it in my memory where it will always be bold, confident, and alive. I was in a hurry to learn how to read and write as a child. I couldn't wait for my schoolteacher to teach me how to read and write in script -- which I felt was about as related to print as cuneiform was to the Roman alphabet. I remember feeling duped by the fact that technically I could read, but the written script of adults was still very much a mystery to me. I must have been in second grade when I realized I wasn't going to learn script until the third or fourth grade. That was way too long to sit and wait! So, I asked my mother to teach me. My mother had a beautiful, flowing script. She used to write with a fountain pen. I believe it was a Parker, and the ink she used was blue-black Pelikan ink. Her handwriting was consistent -- whether she was writing a letter to her sisters who lived abroad or jotting down a phone number -- it was always legible and pristine. Learning script from my mom wasn't easy. She was very exacting and demanding. I don't recall her enforcing any kind of method (like the Palmer Method), but she did show me the correct way to draw the letters: where to start a letter and where to end it, how each letter connects to the next, what each letter should look like. Taking my hand in hers, she would show me, as if to impart her own muscle memory, how to form each letter. We did this over and over, and then she would leave me to practice on my own. I didn't need to be told to practice. I knew that how well my handwriting turned out after that point was entirely up to me. Over the course of primary and secondary education, I developed a facility for calligraphy which I credit to my mother. I liked trying to create letterforms with different nibs: round nibs and chisel-edge nibs. I remember the Speedball set my mother gave me for my birthday. I spent so many hours just practicing letterforms and later on, phrases or quotations. I managed to turn my aptitude for calligraphy into a profitable enterprise over the years: I've painted names on Christmas ornaments, addressed invitations, written out place cards, etc. But there was one style that had eluded me all these years -- Copperplate. It's a style of writing that was quite the rage in the 18th and 19th century. About 10 years ago I picked up an instructional book, hoping to teach myself Copperplate calligraphy. I gave it a few tries but it just required such an investment of time that I just couldn't make any progress with it. In the Spring of 2001, I was laid of from my job as an art director. In an effort to install a sense of order to my day, I spent the first 4 hours of my day making networking calls and trying to hunt down freelance opportunities. But the rest of the day I devoted to perfecting my Copperplate. I went through a lot of paper and ink. In about a month I had a new job and a new skill. Whether I'm addressing invitations or writing in my journal, I'm always a little amazed that the marks that I make on paper make sense to somebody else. With a few strokes of a pen I am able to convey ideas, feelings, even exact locations. What a marvel it is to write! How truly extraordinary!